Patricia Wells is an internationally recognized cookbook author, restaurant critic and teacher who divides her time between Paris and Provence. 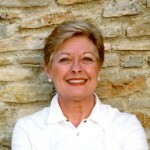 Her book Patricia Wells at Home in Provence (1996) won the James Beard Award for Best International Cookbook. She served as restaurant critic for the International Herald Tribune from 1980-2007 and for L’Express from 1988–1991. She remains the only American food writer to have been a restaurant critic for a major French publication. Her popular cooking classes in both Paris and Provence are usually booked more than a year in advance.